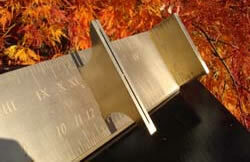 Spot-on-Sundials - accurate, beautiful, contemporary sundials in brass and stainless steel. 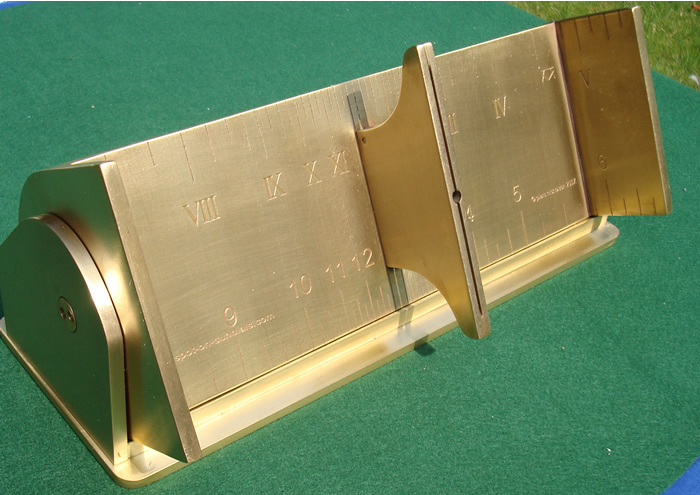 The original brass Spot-On Sundial was designed by Piers Nicholson and introduced to the market in 2001. Since then, more than 900 customers all over the world have bought them as presents for big occasions or simply for their own pleasure. 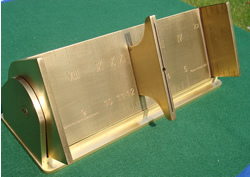 The brass horizontal Spot-On Sundials are made in 3 different sizes, either on square baseplates measuring 17, 27 or 34 cms., or on round baseplates measuring 15, 25 or 32 cm. diameter. 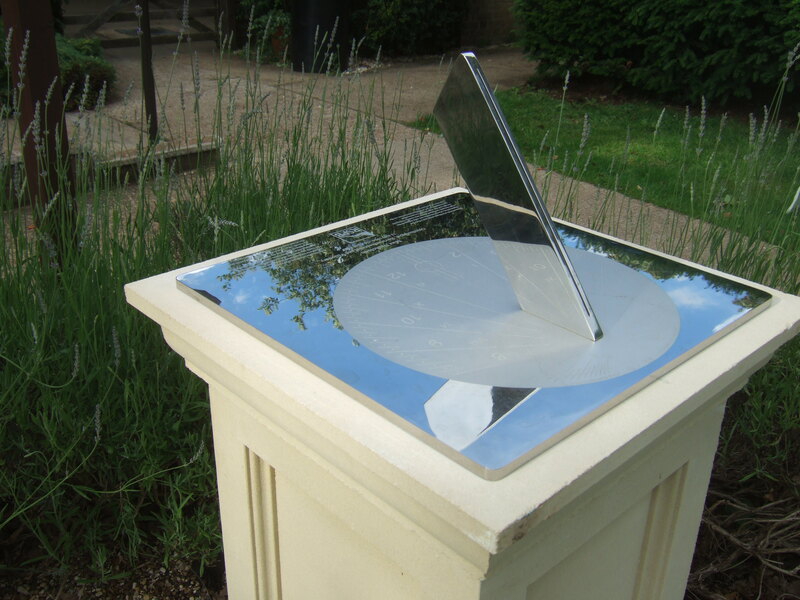 *The Spot-on sundial can be read to within a minute or two (it is marked in 5 minute intervals). 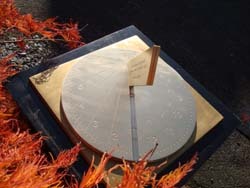 Unlike many sundials, the Spot-on sundial is scientifically accurate and, if set up accurately, will display True Time with complete accuracy - see explanation below centre. Please click on any of these pictures to get a much larger version! Stainless steel Spot-On Sundials incorporate the "line of light" feature shown in the picture (left); this enables them to be set up with great accuracy. They also give interesting reflections of trees, clouds and buildings. The surface is mirror-polished apart from the shot-blasted matt circle which gives a strong shadow for the hour lines. The custom-made dials (24 cm. and larger) are individually designed for the exact latitude of their location, and the engraving can be simple or elaborate to suit the needs of the customer. show garden showing noontime "line of light"
(centre) 42 cm. sundial in Horniman Museum garden mounted on a wooden post and with a more elaborate inscription (above) The standard 15 cm. standard stainless sundial, designed for small gardens and balconies, with a special engraving on the side of the gnomon. This can be supplied with a stainless steel plinth. 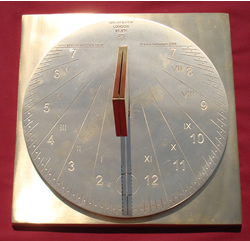 The brass polar sundial (right) is so-called because the dial plate is in the same plane as the gnomon, which points to true North on the earth, and the north celestial pole in the sky. 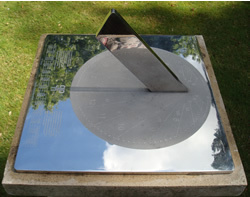 This dial is a domestic version of the much larger Tylers and Bricklayers Millennium Sundial near the Millennium footbridge in central London. 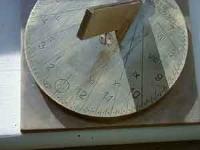 The sundial which can travl the world with you! 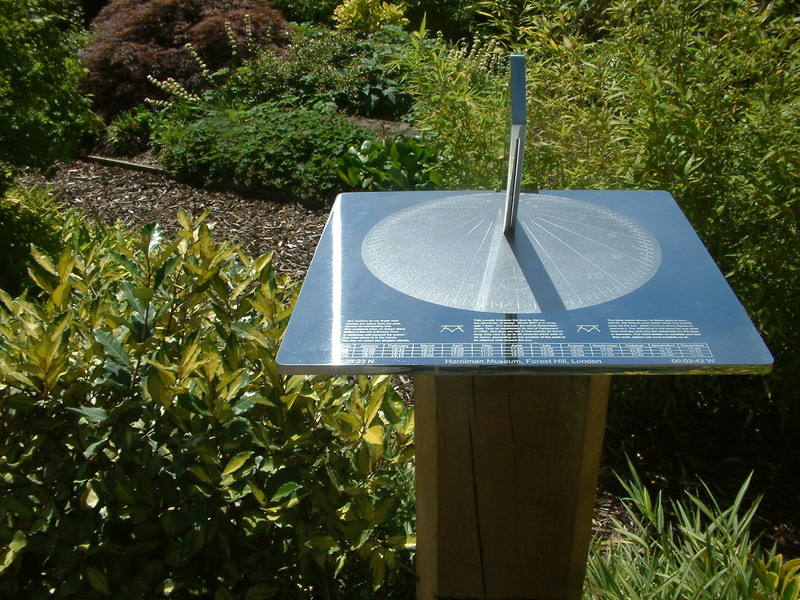 Our new Universal Polar Sundial is adjustable, and so can be set exactly for any latitude between the Equator and the Arctic Circle. And, if you move house, you can just reset it to your new latitude! 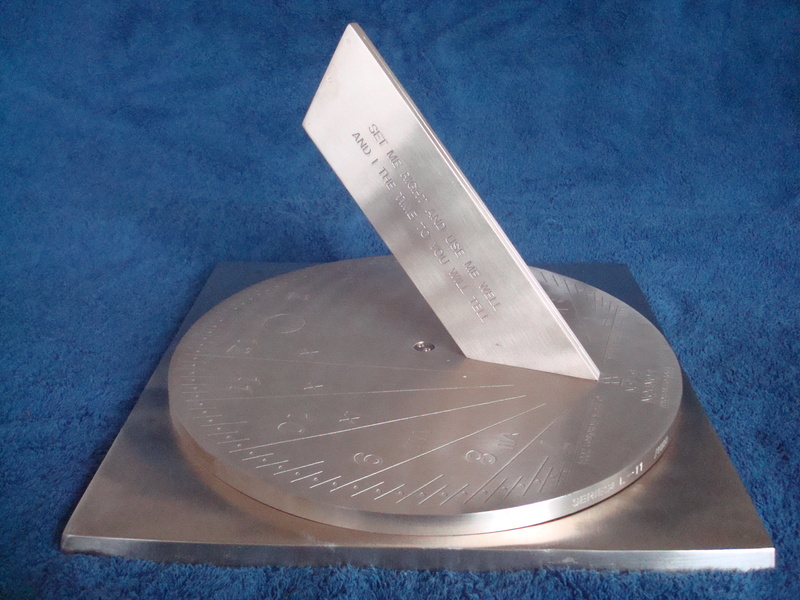 The Universal Polar Sundial is available in two models, one with a large baseplate which can be engraved with a substantial message, and the other with a small baseplate. It will shortly be available in a Southern Hemisphre version with the hours increasing from right to left. The new Spot-On Sundial combines modern functional design with unrivalled accuracy. 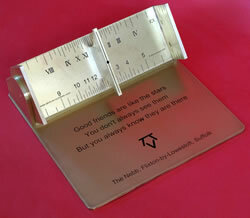 All models can have an engraved message on the side of the gnomon to give a unique gift for an anniversary, birthday, wedding, or special event. These stainless steel dials are individually designed for their precise location and incorporate engraving text, logos, or drawings agreed with the client. These elegant and robust dials incorporate the split gnomon, so that every day at solar noon a line of light will shine through the gnomon along the noon line. you can now buy it in our new Spot On Sundial store! 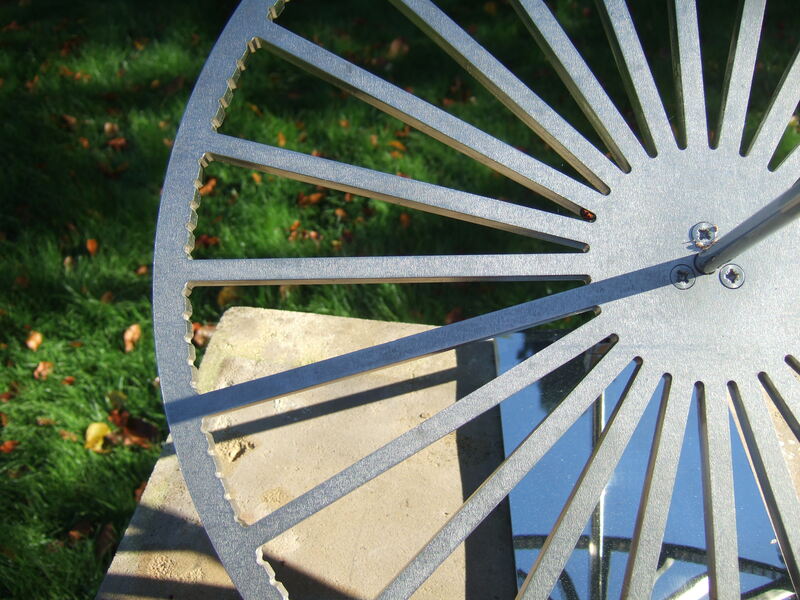 People often ask what is so special about the Spot-On Sundial and how it came to be designed. If you too are interested in this, here is the full story! If you are ordering the original 17 cm. 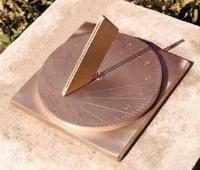 brass sundial, first choose the right model for your latitude. Then decide whether or not you want an engraving. Then go to our Spot On Sundial shop to order. 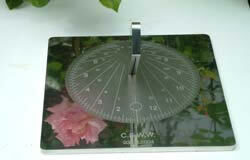 For other sundials, please send us an Email saying where you live and which sundial model you are interested in. 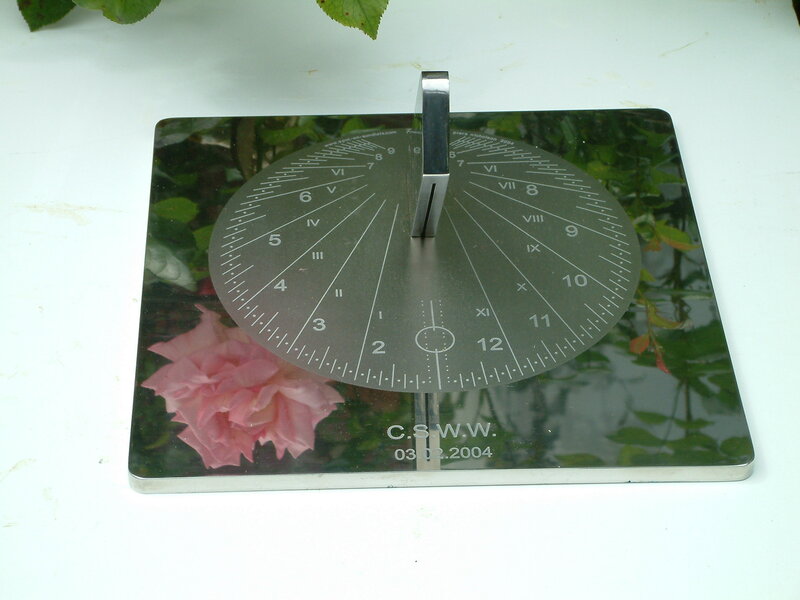 Detailed instructions are provided for brass and stainless steel sundials, advanced set up for super accuracy, indoor set up. 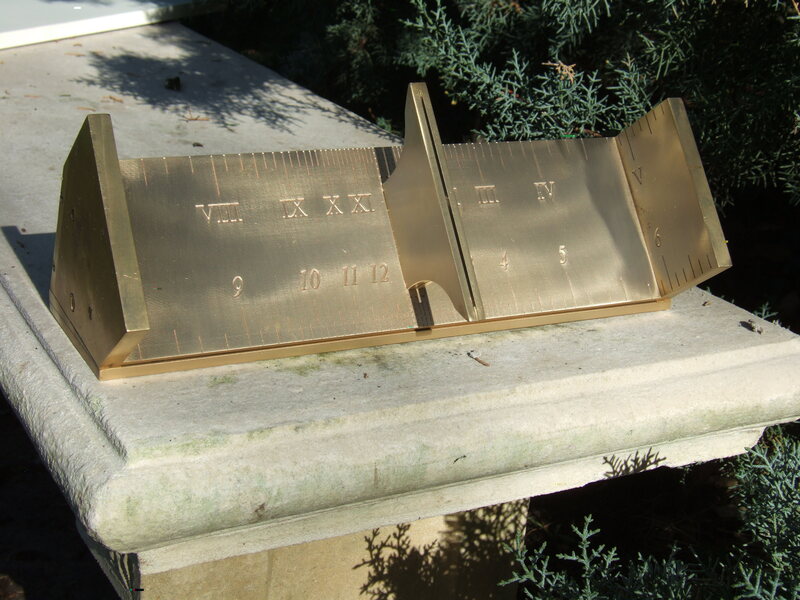 Horizontal sundials need to have the angle between the gnomon (which casts the shadow) and the dialplate appropriate to the latitude where they are to be used. The original 17 cm. square Spot-On Sundial is made in seven models suitable for most of the Northern hemisphere, and there is also one Southern hemisphere model - use this page to help you decided which is the correct model for you. 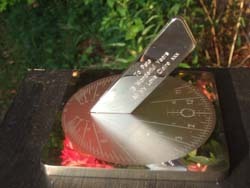 If you want the gnomon angle to be exactly right for your latitude, you can use our advanced setup, but this is not necessary for most practical purposes unless you can be certain that the base is accurately horizontal to better than a half of one degree. Three of our larger models (two in stainless steel and one in brass) are custom-made for the latitude where they will be placed.